Experimente las fascinantes melodías y la intensa acción de la Ópera de Sichuan durante una actuación de 1.5 horas en el Shufenf Yayun Teahouse de Chengdu. Maravíllate ante los deslumbrantes bailarines y los asombrosos acróbatas, que ofrecen un espectáculo extravagante de color y cultura. Mejora para disfrutar de vistas del escenario sin igual desde lujosos asientos y deleita a tu paladar con bocadillos para acompañar un té de Sichuan. Para disfrutar de la mejor experiencia, opta por el cuidado del oído, un masaje chino y una sesión de disfraces que incluye una fotografía de cortesía. 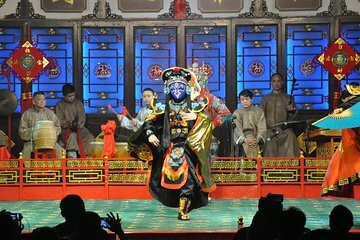 Diviértete con las artes escénicas de Sichuan con títeres, máscaras, música folclórica, acrobacias y danza. ¡Elija entre cuatro opciones de asientos, incluido el acceso VIP a un masaje chino, el aseo personal o la sesión de fotos! Diríjase a Shufeng Yayun Teahouse, una construcción cultural ubicada en el Parque Cultural de Chengdu. Aventúrese dentro del edificio ricamente decorado y tome asiento en la posición seleccionada. Si ha optado por un asiento VIP, sumérjase en una silla de lujo y disfrute de un relajante masaje y una sesión de aseo antes de que comience el espectáculo. Para obtener información más detallada sobre cada opción VIP, consulte la sección Itinerario a continuación. Escuche cómo un expectante silencio desciende sobre la multitud mientras las luces se apagan y las cortinas se abren para revelar un deslumbrante diseño de escenografía y coloridos trajes. Vuélvete hipnotizado mientras observas una magnífica mezcla de títeres, música folclórica, acrobacias y bailes. Vea cómo la rica cultura del sudoeste de China cobra vida a través de tres actos distintos, que incluyen Spitting Fire, Rolling Light y Changing Faces. Sumérjase en los cuentos de leyendas y amor y vea espectáculos de títeres que representan el arte popular antiguo mientras disfruta de un tradicional servicio de té de Sichuan en su mesa. Mejora para disfrutar de bocadillos especiales que complementan las bebidas refrescantes. Al final del espectáculo, aplauda ruidosamente y aventúrate en el vestuario para transformarte en un personaje colorido si te has ascendido a la experiencia VIP. Regrese a su hotel con recuerdos mágicos después de que concluya el espectáculo. Cuando llegue al teatro, elija una de las tres opciones: un masaje, aseo personal, oportunidad para tomar fotos con disfraces o experiencia con marionetas. Masaje: mientras se sienta en su asiento, relájese mientras recibe un masaje de cabeza y hombros antes de que comience el espectáculo. Preparación del oído: haga que un profesional del cuidado de los oídos limpie su oído, un servicio tradicional que normalmente se realiza en una casa de té o teatro. Foto del vestuario: después del espectáculo, dirígete al backstage para ver cómo se aplica la máscara tradicional de la ópera de Sichuan mientras te vistes con el disfraz. ¡Entonces posa para tu fotografía! We had a brilliant evening watching the Sichuan Opera, the performance was almost like a variety show, different performers demonstrating different techniques. The highlights were the face changing and the shadow puppets. If you go to Chengdu, make sure you see the opera! This was my 12 year old's favorite activity we did in China. It is very entertaining for the kids.I recommend going VIP so you can sit in front and get free massage, ear grooming brother options. My kids chose to play with puppets and see how they work. It lasts about an hour and is a fun evening. Go early to walk around the area as it is a very vibrant and happening area. Since we live in Chengdu, whenever we have visitors, we take them here. It's an outdoor venue, but it is covered and during the winter they have mini fireplaces. I would recommend getting there early to go backstage and get made up in costume and meet the cast. Beware they will try to upsell you when you arrive or at your seat...ear cleaning, massage, etc. But definitely a must do in the 'Du! The opera was a nice performance, HOWEVER, this was the WORST Viator experience I've ever had and I've been using Viator quite a bit.  The Viator VIP option is misleading advertising / false advertising of the services provided. With the VIP upgrade, we were supposed to ... choose ONE OF THREE options: a massage, ear grooming or photo opportunity in opera makeup and costume. I chose the photo opportunity in opera makeup and costume option. After the opera staff applied the makeup, I was forced to pay an extra 100 yuan in order to have a costume. The staff had indicated to me even though I showed them the Viator voucher indicating makeup and costume that the makeup does NOT come with the costume. They said it didn't matter what the voucher said - that was their policy that if I wanted the costume, I would need to pay an extra 100 yuan minimum. I reached out to the local tour contact provided by Viator and he confirmed in an email which I still have... that I was mistaken - for the Viator voucher, it is choose one of FOUR options. I sent Viator a formal complaint via email several times and have yet to get a response from them. As I'm looking through this tour, it still says the SAME THING - choose ONE OF THREE options - I want to caution everyone thinking about the doing the VIP package to be ready to pay for the costume if you are looking to do the makeup and costume option because it's not included even if you show your voucher. And one more tip - whatever option you choose, you should plan to arrive at least 1 hour before the show starts because my other travelmates chose the massage and the theater staff said that we can get the massages after the show, but after the show, the entire theater was emptied out with no massages available. So while we had paid for the VIP package, other than the seats, we did not get any of the stated VIP options. This was a very disappointing experience. Viator needs to either sort it out with their supplier and make sure the VIP option includes makeup and costume or Viator needs to charge more to make sure costume is included or Viator needs to put a note indicating that guests will need to pay for the costume separately. The opera is fascinating experience in Chengdu. I especially like the hand figures and the face changing. Worth a visit. A lot of fun :D! 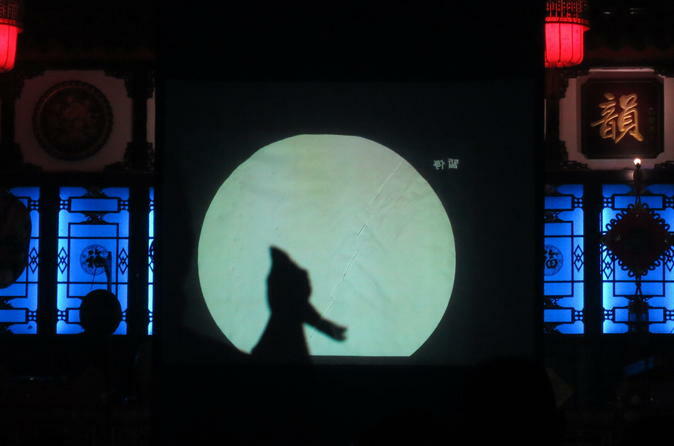 My daughter and I especially loved the shadowplay, facechanging and acrobatics. The shadowplay was brilliant! I could easily have watched that act for hours! Interesting tour. Avoid the ear cleaning before the show which is very painful. Bought 2 VIP tickets , got to theater on time , told go go ticket office across the road . Was not told it was in a different location from theater. Got tickets and went to theater . They sat us in toward the back . I said no , these are too far away. I bought VIP tickets and they told me it was near the front . They said no, you wrong . They would not make ajustments to seats . I asked for a manager to get involved . The show time started and still not seated. After a while we were finally seated near the front in the corner so hard to see half the stage. There were also 12 drunk Chinese men in front of us talking loudly and using cell phones. We could not participate in 2 of the VIP options because the show already started. We missed the first part of the show. They said we can do the face painting and photos after the show so we did that even though we preferred the others. We went to the face painting area and were told a charge of 250rmb plus more money for the photos . We reluctantly paid the 250 more and opted for no photos. The whole situation made for stressful evening and cost me twice the amount agreed , so could not enjoy the show.